Dendritic cells (DCs) are a heterogeneous population of myeloid immune cells characterized by phagocytic and antigen presentation capacity. Although DCs are categorized as innate immune cells, they are responsible for initiating adaptive immune responses and, in particular, for the antigen-specific activation of naive T cells. Activated DCs show increased antigen uptake, migratory capacity, and ability to prime naive T cells in lymph nodes. The role of tissue DCs in regulating autoimmunity, allergies, and food intolerance, as well as their key function in vaccinations, have made DCs a focus of basic and translational research over the last decade. DCs are located in several tissues at the interface with the external environment, but they also travel in the blood stream and infiltrate tissues. Thus, researchers can obtain human DCs from donor and patient blood, which is less difficult than working with solid tissues. Furthermore, recent findings show that primary DCs isolated from peripheral blood can be used in cancer vaccination strategies. Three subsets of DCs can be identified in peripheral blood: plasmacytoid DCs (pDCs) and myeloid DCs (mDCs) or conventional DC (cDCs), which are further subdivided into two subsets based on the expression of the surface markers CD1c (BDCA-1) and CD141 (BDCA-3). pDCs produce large amounts of type I IFNs, IFN-α, and IFN-β in response to binding nucleic acids typical of viruses and bacteria on toll-like receptors (TLR). TLR7 recognizes single-stranded RNA, and TLR9 recognizes CpG DNA. IFNs have pleiotropic effects on several immune cells including T cells, NK cells, and mDCs, which makes pDCs critical responders to viral infections. However, the antigen uptake capacity of pDCs is inferior to mDCs and at steady-state, pDCs can induce tolerance rather than immune response (PMID: 28536413, 25852695). Human pDCs are defined as CD303 (BDCA-2)+, CD304 (BDCA-4/Neuropilin-1)+, CD123+, CD4+, CD45RA+, CD141 (BDCA-3)dim, CD1c (BDCA-1)–, and CD2–. They lack expression of lineage markers (CD3, CD14, CD16, CD19, CD20, CD56) and express neither myeloid markers, such as CD13 and CD33, nor Fc receptors, such as CD16, CD64, or FcεRI (PMID: 16920966, 11602645, 11913066). CD1c+ mDCs, also called cDC2 or MDC2, account for 0.6% of PBMCs. They produce IL-12 upon TLR3 or TLR8 stimulation with poly (I:C) or R848, which leads to polarization of TH1 CD4+ T cells and priming of naive CD8+ T cells. The CD1c (BDCA-1) antigen is a member of the CD1 protein family that are structurally related to MHC class I proteins and mediate the presentation of non-peptide antigens to T cells. The CD1c antigen is specifically expressed on DCs that are CD11chigh CD123low. CD1c+ mDCs have monocytic morphology and express myeloid markers such as CD13 and CD33, as well as Fc receptors, such as CD32, CD64, and FcεRI. Furthermore, they are Lin (CD3, CD16, CD19, CD20, CD56)–, CD2+, CD45RO+, CD141 (BDCA-3)low, CD303 (BDCA-2)–, and CD304 (BDCA-4/Neuropilin-1)–. A minor proportion of CD1c+ mDCs expresses CD14 and CD11b. CD1c is also expressed by circulating B cells and by CD1a+ DCs generated ex vivo from monocytes or hematopoietic precursor cells. CD141+ mDCs, sometimes also called cDC1 or MDC1, are a very rare subset of blood DCs representing less than 0.05% of total PBMCs. They share several functional and phenotypical features with CD1c+ mDCs, such as IL-12 secretion and TLR8 expression, but are also characterized by IFN-λ secretion upon activation. CD141+ mDCs exhibit better cross-presentation of antigens derived from dead cells thanks to expression of the necrotic receptor Clec9a. This receptor and the chemokine (C motif) receptor 1 (XCR1) are exclusive markers of this subset. XCR1 is also expressed by the corresponding mouse subset CD8α+ DCs. CD141 (BDCA-3)+ mDCs are Clec9a+, XCR1+, CD11cdim, CD123–, CD1c (BDCA-1)–, and do not express lineage markers such as CD3, CD14, CD16, CD19, CD20, or CD56. They express myeloid markers, including CD13 and CD33, and are monocytic in appearance. In contrast to CD1c+ mDCs, CD141+ mDCs do not express CD2 and Fc receptors such as CD32, CD64, and FcεRI. They also differ in terms of toll-like receptor expression, cytokine production, and T helper cell polarization. The CD141 (BDCA-3) antigen is expressed at much lower levels on CD1c+ mDCs, pDC, monocytes, and granulocytes in blood. 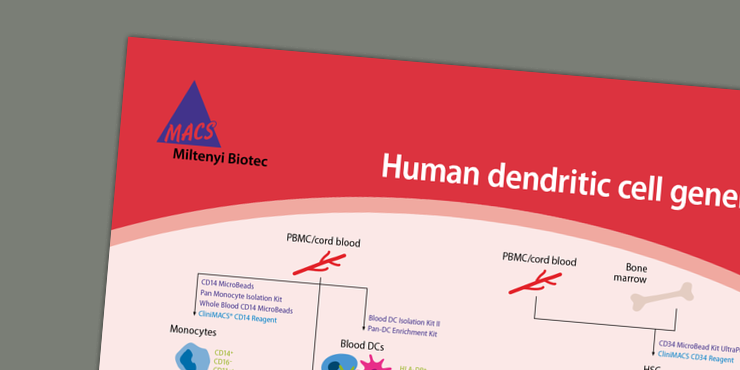 Miltenyi Biotec has created dedicated application protocols for working with human DCs. Isolation of DCs from peripheral blood requires upfront sample processing, typically isolation of peripheral blood mononuclear cells (PBMCs) by density gradient centrifugation. For detailed information, see Human peripheral blood. DCs are a rare population in peripheral blood. Therefore, it is necessary to use high-quality tools that can provide high purity and recovery in the isolation of DCs. For details on MACS® Cell Separation Technology, see the MACS handbook chapter Magnetic cell separation. All three DC subsets can be easily isolated from blood using the Pan-DC Enrichment Kit, human, which depletes non-target cells in a single step. Pre-enrichment of untouched Pan-DCs from human PBMCs. Cells were isolated using the Pan-DC Enrichment Kit, human, a MidiMACS™ Separator and an LS Column, and then fluorescently stained with CD303 (BDCA-2)-FITC, CD141 (BDCA-3)-APC, CD1c (BDCA-1)-PE, and CD20-PerCP. Flow cytometry analysis was done on the MACSQuant® Analyzer, where cell debris, dead cells, and B cells were excluded based on scatter signals, propidium iodide fluorescence, and CD20 expression. The Plasmacytoid Dendritic Cell Isolation Kit II, human enables isolation of untouched human pDCs from PBMCs with high yields. The CD1c (BDCA-1)+ Dendritic Cell Isolation Kit includes a depletion reagent for B cells and monocytes prior to the enrichment of CD1c+ mDCs, and the CD141 (BDCA-3) MicroBead Kit is designed to isolate CD141 (BDCA-3)++ mDCs from PBMCs. DCs are rare cells and their phenotypic characterization can be challenging. Thus, it is important to have optimal tools to evaluate findings in clinical research, for example. Building on extensive expertise with DC subsets, Miltenyi Biotec has created a panel of REAfinity™ Antibodies to easily analyze human primary DC populations. This panel is reviewed by Dzionek et al. (PMID:11086035) and allows the identification of the three DC subsets in only 7 colors. There are two major difficulties to overcome experimentally when working with DCs: they do not proliferate and they are found in low frequencies. For these reasons, it is important to work with cell culture products that guarantee high cell viability. Miltenyi Biotec offers high-quality cytokines and stimulation reagents that ensure consistent results from the cell culture and stimulation of DCs. After isolation, enriched DCs are cultured with recombinant cytokines, such as Human IL-3, Human GM-CSF, and Human Flt-3 Ligand. They can then be activated via exposure to antigens and/or toll-like receptor (TLR) ligands. As antigen-presenting cells, DCs can be pulsed with antigens to activate T cells in an antigen-specific way. Effective priming of naive T cells, as well as fast and efficient re-stimulation of CD4+ and CD8+ T cells in an MHC class– and haplotype-independent way, can be achieved with PepTivator® Peptide Pools. These 15-mer peptides with 11-amino-acid overlaps cover the complete sequence of an antigen, and Miltenyi Biotec offers extensive panels of virus- or tumor-specific antigens. Structure of PepTivator Peptide Pools. Optimal stimulation of DCs is necessary for robust immune responses that lead to desired T cell activation. Several studies aim to find the right stimulation for DCs to induce such a response. The ability of a DC to respond to a specific stimulus depends on the composition of pathogen recognition receptors, in particular toll-like receptors (TLRs), which recognize highly conserved structural motifs as signatures of invading pathogens. Miltenyi Biotec offers a broad selection of products for DC activation via TLR ligands. TLR3 recognizes virally derived double- or single-stranded RNA leading to activation of immune cells such as DCs and B cells. The natural ligands for TLR3 can be mimicked by synthetic RNAs (oligoribonucleotides or ORNs) like polyinosinic-polycytidylic acid, poly (I:C). TLR7 and TLR8 are involved in responses to viral infection. They recognize single-stranded RNAs as their natural ligand, as well as small synthetic molecules. Miltenyi Biotec provides high-quality TLR7/8 agonist ORNs for the activation of TLR7 only, TLR8 only, or TLR7 and TLR8 simultaneously, each with respective controls. TLR9 recognizes synthetic oligonucleotides containing CpG motifs (CpG ODNs) that mimic the immune stimulatory effect of bacterial DNA, promoting TH1 and pro-inflammatory cytokine induction to facilitate maturation and activation of DCs and other antigen-presenting cells. Miltenyi Biotec offers four classes of TLR9 agonists: A, B, C and P. The A-class and P-class agonists are recommended for pDC activation. Although primary DCs open new exciting avenues to investigate DCs for basic and clinical applications, for decades human DCs have been generated in vitro from peripheral blood monocytes using GM-CSF and IL-4 to drive differentiation over 5–7 days. For products for the isolation of monocytes, see cell separation reagents. 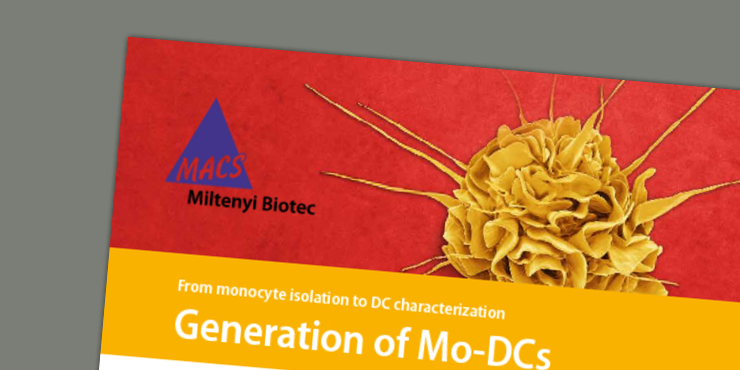 These monocyte-derived DCs (Mo-DCs) have the characteristics of immature DCs and can be matured by culturing them in the presence of microbial, pro-inflammatory, or T cell–derived stimuli. Mo-DCs have been tested in a broad range of immunotherapy-based protocols, primarily for cancer research.